Can you live your life by what The Twilight Zone has to teach you? Yes, and maybe you should. 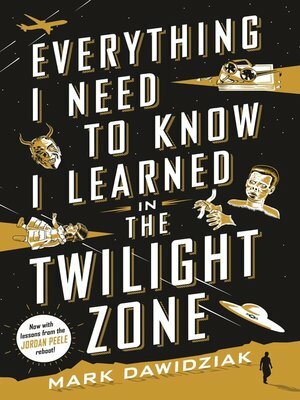 The proof is in this lighthearted collection of life lessons, ground rules, inspirational thoughts, and stirring reminders found in Rod Serling's timeless fantasy series. Written by veteran TV critic, Mark Dawidziak, this unauthorized tribute is a celebration of the classic anthology show, but also, on another level, a kind of fifth-dimension self-help book, with each lesson supported by the morality tales told by Serling and his writers. The notion that "it's never too late to reinvent yourself" soars through "The Last Flight,'' in which a World War I flier who goes forward in time and gets the chance to trade cowardice for heroism. A visit from an angel blares out the wisdom of "follow your passion" in "A Passage for Trumpet." The meaning of "divided we fall" is driven home with dramatic results when neighbors suspect neighbors of being invading aliens in "The Monsters Are Due on Maple Street." The old maxim about never judging a book by its cover is given a tasty twist when an alien tome is translated in "To Serve Man."